So we have the awesome Peanut Butter Passion, the Pretzel Brulee, and now we're going to try one that I'm pretty sure my wife should enjoy: It's cheesecake time! 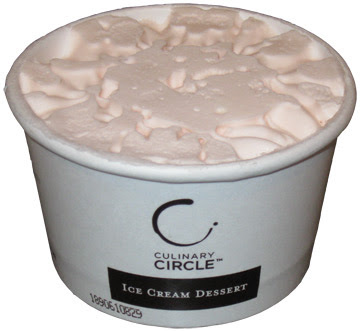 Behold Strawberries 'N Cream Cheesecake Ice Cream Dessert. 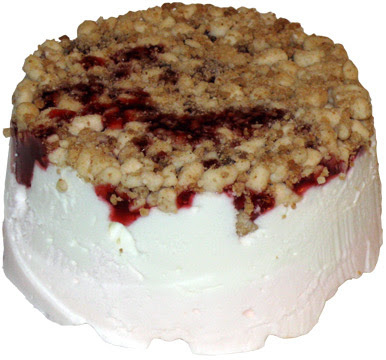 Our little pink friend is billed as "layered strawberry cheesecake flavored ice cream and vanilla flavored mousse; topped with strawberry sauce, cheesecake pieces and sprinkled with graham cracker crumbs". Ok, it's unwrapped and I can smell a mild scent of strawberry. Good sign. Let's keep going. Ok, it's flipped over and we're all smelling cheesecake. I love how these little guys smell fresh ...it's ...iunno, relaxing I guess. It also looks pretty darn good with just a bit of seep through of the strawberry sauce through the cheesecake, but I actually think that makes it look tastier (you know the sauce is plentiful and that the flavors have blended). We dig in and 2 of us our amused. I'm starting to think these are aimed at adults because my daughter is 0-3 with liking these things (and anyone who reads this blog knows she eats pretty much any ice cream product). This is not necessarily a bad thing, we adults eat just as much ice cream (if not more) than kids and it's nice to have our own products. sorry, went on a tangent there. My wife definitely approves and I think this is a respectable treat, though it's not perfect. You should definitely try it, though be warned the strawberry sauce is a bit potent (You can probably tell from the picture it's a bit more of a gel than a sauce. at no point was it running down the sides of the dessert). The ice cream and mousse are good quality and go down easy. The topping is pretty good, not awesome, but still nice. I'm looking for the right word and I just can't think of it. I didn't eat the whole cup, and I didn't need to, these desserts continue to be quite filling. I'm left with an aftertaste mostly of strawberry with a hint of cheese. 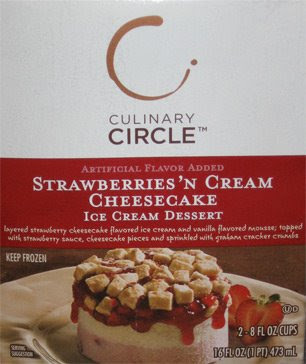 So, Culinary Circle has another decent treat here, nothing to die for, but I think all cheesecake lovers should give it a try.